Registration is OPEN for the KC 5K Run/Walk! 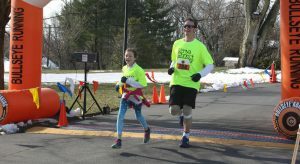 We invite you to join us for the Kenya Connect 5k Run/Walk being held on Saturday, March 30, 2019 at 9:00 am at St. John’s Episcopal Church in Ellicott City. Winding through the beautiful neighborhood of Dunloggin, the race raises funds for the work to enrich education for 17,000 students at 55 partner schools in rural Kenya. This year we are thrilled that Patrick Munguti, Director of Technology and Education Programs will be in the U.S. to run the race. Come meet Patrick, hear about our work and have a fabulous time! All runners/walkers are invited to set up a crowdrise page to help support the work of Kenya Connect. The top fundraiser will win a special prize. Top three runners in all age categories will win a hand-carved medallion from the woodcarvers of Wamunyu! We also invite runners/walkers to create a team. The fastest team (top 5 runners of the team) and the team who raises the most money will win prizes. Kenya Connect Awarded 15K PayPal Tech for Good Grant!